In a large bowl, whisk together 2 cans of Campbell's Cream of Chicken soup with 1 can of milk, until smooth. Add the mixed vegetables and chicken and stir until well combined. Spread the mixture in a 9 x 12 baking pan. Place the 8 biscuits on top of the chicken mixture and bake for approximately 18-20 minutes or until the chicken mixture is bubbly and the biscuits are browned and baked through. It's as easy as that! 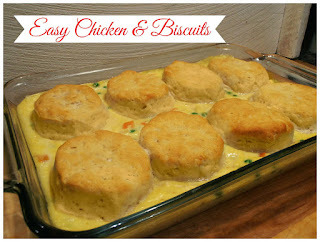 I served the chicken and biscuits with a simple green salad, and we like to put a little butter on top of our biscuits. The little kids and the teenager love it. Mission accomplished!